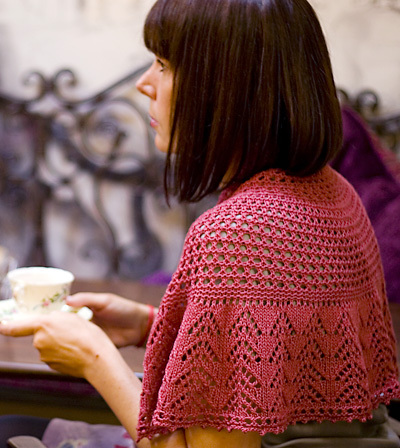 The Afternoon tea shawlette was designed with a 1950s style frock and a perfectly frosted cupcake in mind. This frothy, lacy little number is just perfect for wrapping around the shoulders. Although more for adornment than warmth, it could also be worn around the neck with a cardigan or coat to keep out a breeze. And the best news is that it can be knitted up from a single skein of sock weight yarn - perfect for those beautiful, lonely, solo skeins in your stash. Afternoon tea's crescent shape creates a pretty drape around the shoulders and looks lovely in both the solid or variegated yarns suggested. 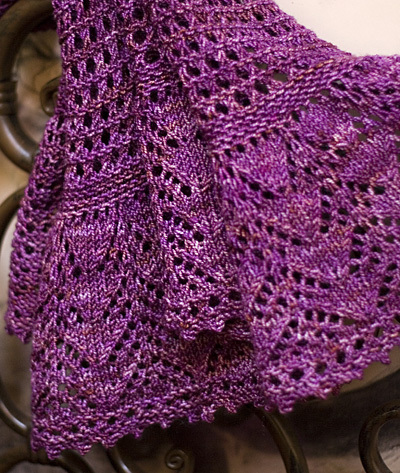 The shape is a nod to Elizabeth Zimmermann's Pi shawl with the number of stitches roughly doubling at every increase row. 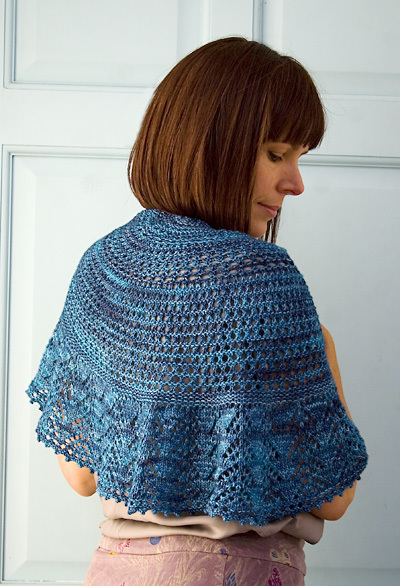 This could make an ideal project for those dipping their toe into lace knitting as the lace patterns in the shawl are quite straightforward. So get out your vintage china, whip up some cakes and invite your friends around for a nice cup of tea. Gauge is not critical for this project, as long as you like how the fabric looks. Row 3 [WS]: K1, kfb, k1, kfb, k1. 7 sts. Row 5 [WS]: K1, kfb, kfb, k1, kfb, kfb, k1. 11 sts. Row 9 [WS]: K2, [yo, k1] to last 2 sts, yo, k2. 19 sts. Row 15 [WS]: K2, [yo, k1] to last 2 sts, yo, k2. 35 sts. Row 19 [WS]: K2, [yo, k2tog] to last st, k1. Row 23 [WS]: K2, [k2tog, yo] to last 3 sts, k3. Row 27 [WS]: K2, [yo, k2tog] to last st, k1. Row 31 [WS]: K2, [yo, k1] to last 2 sts, yo, k2. 67 sts. Row 35 [WS]: K2, [yo, k2tog] to last st, k1. Row 39 [WS]: K2, [k2tog, yo] to last 3 sts, k3. Row 43 [WS]: K2, [yo, k2tog] to last st, k1. Row 47 [WS]: K2, [k2tog, yo] to last 3 sts, k3. Row 51 [WS]: K2, [yo, k2tog] to last st, k1. Row 55 [WS]: K2, [yo, k1] to last 2 sts, k2. 130 sts. (Note: there is no yo before last 2 sts on this row). Row 59 [WS]: K2, [yo, k2tog] to last 2 sts, k2. Row 63 [WS]: K2, [k2tog, yo] to last 2 sts, k2. Repeat Rows 56-63 4 more times. Row 103 [WS]: K2, [yo, k1] to last 2 sts, yo, k2. 257 sts. Row 105 [WS]: K2, purl to last 2 sts, k2. Note: From here, work from following written directions or the Branches Pattern chart as you prefer. Row 106 [RS]: K2, [k3, k2tog, yo, k1, yo, ssk, k3] to last 2 sts, k2. Row 107 [WS](and all following wrong side/odd numbered rows in this section): K2, purl to last 2 sts, k2. Row 108 [RS]: K2, [k2, k2tog, yo, k3, yo, ssk, k2] to last 2 sts, k2. Row 110 [RS]: K2, [k1, (k2tog, yo) twice, k1, (yo, ssk) twice, k1] to last 2 sts, k2. Row 112 [RS]: K2, [(k2tog, yo) twice, k3, (yo, ssk) twice] to last 2 sts, k2. Row 113 [WS]: K2, purl to last 2 sts, k2. Repeat this 8-row pattern 3 more times. Row 140 [RS]: K2, [yo, k2tog] to last st, k1. Cast off 2 sts, [slip resulting st back onto left needle, cast on 2 sts using knitted cast on method, cast off 5 sts] to end. Soak in lukewarm water for 20 minutes. Gently squeeze out excess water and roll in a towel. Lay flat on blocking surface and using blocking wires gently stretch into a semi circular shape. 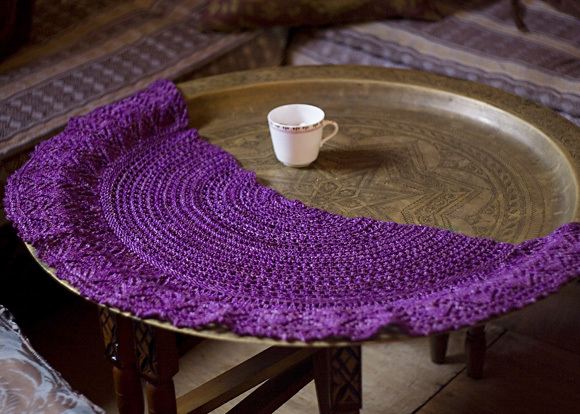 Use two separate wires along the top edge as it will form an angle so the shawl is slightly more than a semicircle. 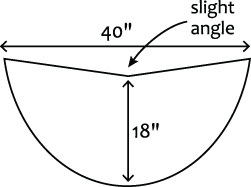 See diagram as a guide. 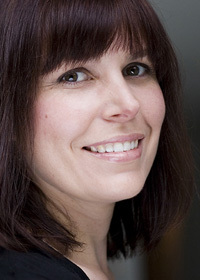 Helen Stewart lives in London, England and is inspired by the culture and fashion in the city. She finds knitting provides a satisfying escape from work and domestic details and is most happy getting immersed in a challenging lace project. She's HellsBells on Ravelry and occasionally blogs here.